For many aspiring entrepreneurs, the ultimate business goal is to develop a multinational presence. However, in order to do so, you must first understand how people from different cultures approach business matters. Of course, the most effective way of gaining this understanding is by travelling abroad, and this is something Middlesex University Business students have the opportunity to do through the MU Wellbeing Foundation. The Foundation works with community groups and businesses to provide placement and volunteering opportunities for students, including international development programmes in Africa, Asia, Europe and America. 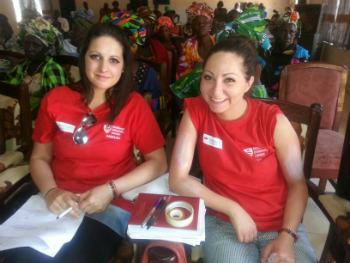 Two students who have benefitted from such a trip are Hendon-based BA International Business third years Ivanka Zapryanova and Angelina Karaivanova, who recently spent ten days in The Gambia. During their visit, the pair worked with Communities Without Borders, the Rural Development Institute and the National Enterprise Development Initiative (NEDI) on projects related to small and medium-sized enterprises. "We talked with NEDI representatives about how to approach a business start-up successfully and I was able to share business strategies I have learnt at Middlesex and explore how they can be utilised in the Gambian business environment," said Angelina, who had the opportunity to visit the National Trade Fair. Angelina and Ivanka both got a chance to put these ideas into action by assisting with the start-up of a business in the Low River region that will supply fair trade power harnessed from the fruit of the baobab tree. Ivanka also delivered a workshop to local students on the importance of market research, sustainability and increasing sales. For aspiring Business students like Ivanka and Angelina, who are graduating from Middlesex this summer, this kind of hands-on learning is invaluable as they prepare to forge successful careers. "Our trip to The Gambia gave me experience in being aware of and adapting to different cultural conditions and ways of doing business," Ivanka said. "I am now more motivated than ever to continue pursuing my dreams." Angelina was equally enthused by the whole experience: "Going to The Gambia was an incredible, once-in-a-lifetime opportunity and was only possible thanks to the generous support of the Middlesex University Wellbeing Foundation and the Business School. "I am certain that with this experience on my CV, I am well-placed to find my dream job after I graduate."